I was told this would happen when I was doing my PhD. The true answer to this question is “I write code in R, do maths, write articles, manage data and read lots of books” but this doesn’t really answer the question implicit in the subtext. “What do you do?” actually means “what do you accomplish” or, perhaps in even more market-ey jargon “what difference do you make in the world?” In answer to that question, it is probably better that I should say: “I describe political groups in order to help them identify potential blind spots, function better internally and connect their ideas to resources.” Also, I tend to focus on the habits of social groups in online social movements. And generally, I use social network analysis to do that. There are tutorials and classes about the main elements of social network analysis if people actually care about things like degree centrality, clustering and path length. It’s all quite fun stuff, especially because I enjoy things like Linear Algebra. However, the details of social network analysis are different from their implication, which are often more interesting. So, I thought to offer ten core implications that make Social Network Analysis Matter. Sorry for the jargon, but this basically means that your ideas are at least partly a function, not only of who you know, but also of who also knows the people you know. You get ideas from others, and sometimes you get to share them back directly. Other times, you share the ideas and it goes nowhere. Even other times you share the idea and it goes through a round of “telephone” before it comes back to you looking like something completely different than what you said. The more attention your ideas get, the more likely it is that there will be some social costs that come with that attention. Some people are more free to share their opinion in public forums than others. Therefore, we should not be surprised to see only a few voices left over after a big online drama. 4. Most Major Social Problems Online are Actually Local New York (or big city) problems. Manuel Castels famously theorized that flows of information across networks are a source of power. More specifically, he argued that virtual space is guided by a “space of flows” that focuses attention on public problems. This space — namely the space of ideas that have mainstream appeal — is usually dominated by those who are the best connected overall. That’s why catcalling ends up being a salient women’s issue that captures more attention than the atrocities of boko haram. People in New York are overall better connected than those in Nigeria and have much more power to spread their messages whatever they may be. Friends give us both social support and hold us accountable when we don’t behave as we should. Acquaintances help us access communities that we otherwise wouldn’t have access to. Friends will give us their shoulders when we lose our jobs, but acquaintances will most likely help us find a new job. So says Mark Granovetter. There are people with cushy executive titles and then there are people that we trust to get the work accomplished. Sometimes you need to get the latter person onside before you can get approval from the former. Networks in real life are often like an amoeba. There is a nucleus that stays more or less stable, but the overall the shape can change dramatically from one moment to the next. Perhaps there may be a way to tell how the shape of the amoeba changes based on the actions of people in the nucleus. Interesting hypothesis – I might test that out some day. It may not be the best situation for our communities as a whole, but most networks will feature a few “representatives” that with a whole bunch of followers. In social network graphs this looks like a “star” with one person in the center and everyone else following that central person. Inside any social group, there are those few people who will show up to a biker bar in the three-piece suit, or attend a Symphony concert in a mohawk. Watch these people because they connect groups in new and interesting ways and encourage innovation. So says Ron Burt (more or less). It’s a double-edged sword, but using social network data, you can find the person who matters most in a network. Consider the hypothetical example of British Colonialists looking for this revolutionary named Paul Revere. In short, there are a lot of ethical questions to consider when using social network analysis. Like any tool, it’s bound to benefit those with resources to use it the most against those who are capable of using it the least. Edward Snowdon seems to have a very important point here. That’s 10 things. Hopefully it helps provide a bit of context for people who know nothing about social network analysis. At the least I hope it shows the potential power the method has to describe the invisible ways that our friends friends’ friends have a real impact on our daily lives. And I did it by showing only one social network graph! 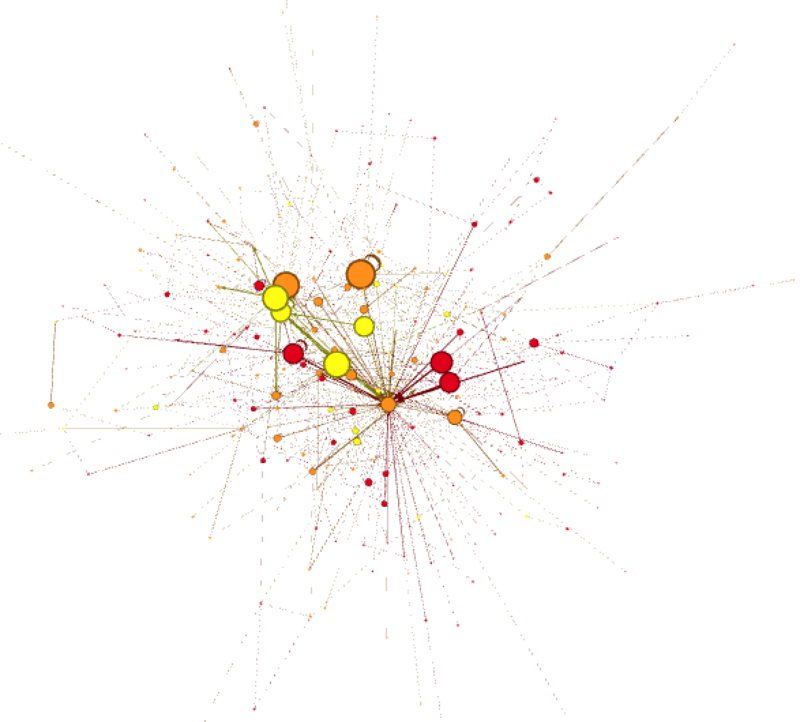 Anyone else have any ideas on some of the big picture things that social network analysis can tell us?